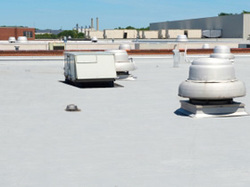 Commercial Roofing of Tulsa, OK provides superior-quality services for Commercial and Industrial buildings in Tulsa including Conklin's Benchmark Premier Roof Coatings. Benchmark has earned a Class 4 hail rating and provides long-term performance. For Tulsa business owners that set their standards high, you can put your trust in Benchmark. With the proper primer application, Benchmark can also be applied over asphalt built-up roofing. The specifications are quite impressive, proving that Benchmark for Tulsa Commercial Roofs provides superior protection. This roof coating has a Hail Rating of Class 4. This means that it can withstand "Severe Hail." The Solar Reflectivity is set at 85%, providing a cooler, and more energy efficient inside. With a drying time of 2-8 hours, this Tulsa Commercial Roof Coating is a completely seamless membrane providing exceptional waterproofing. It is very easy to clean due to the water-based formula it is made of - and has superior dirt resistance. this keeps the reflectivity high longer. With its exceptional elongation, it had the flexibility to withstand building movement during foundation movement or Oklahoma earthquakes. Benchmarks super tensile strength makes it highly resistant to acid rain, air pollutants, and Ultraviolet Rays. It has an astonishing 85% solar reflectivity, which will reduce your cooling costs. Call today to inquire about Conklin's Benchmark Roof Coating and to get an estimate on local Tulsa installation costs as well as energy savings.